The rapid growth of unstructured data is being fed by new types of information from new places, leading to the emergence of new workflows. These new high-value workflows are shaping the ability of organizations to deliver better products, support critical missions and boost their bottom line. As a result, organizations need storage systems that can deliver the performance and enterprise-class capabilities required for supporting these new high-value workflows. Because of the high rate of data growth, storage systems must also be able to scale performance and capacity cost-effectively. Why emerging high-value workflows require a new kind of NAS. What to look for in a scale-out NAS solution that balances between enterprise-grade features and cost-effective scaling. 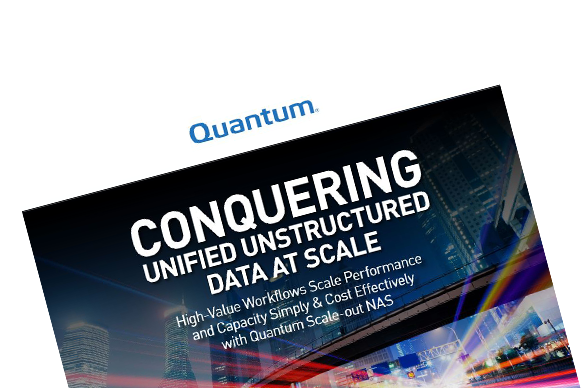 How Quantum Xcellis is the only solution with the flexibility to scale economically while delivering all the enterprise capabilities needed to address modern data growth.